The Royce Speed ankle brace provides excellent ankle protection. Available with and without figure 8 straps for additional support. Popular with athletes, and physicians. The Royce Speed Ankle Brace has taken the traditional stirrup design to an entirely new level. The brace combines all of the best features of a stirrup with a lace-up style support. The Royce Speed Ankle Brace conforms precisely to your ankle for a comfortable fit. The exo-skeleton outer shell design is built directly into the soft, breathable fabric and uses a speed style eyelet lacing feature for easier fitting and quicker adjustments compared to traditional eyelets. 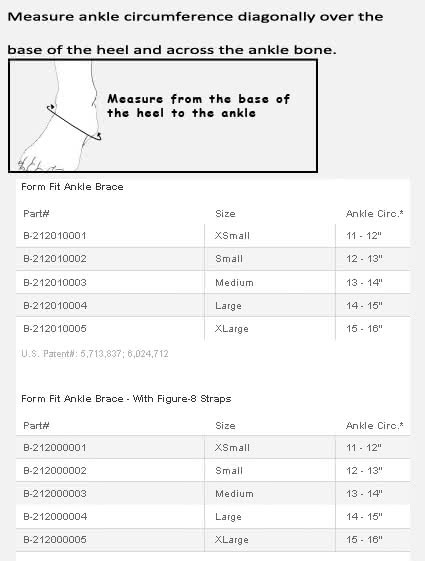 Athletes appreciate how the brace provides 20% more support over traditional stirrup designs. The Royce Speed Brace can be used for all types of sports from basketball to soccer. For great protection for rehab, athletics, and everyday use, it's hard to top this all-around winner. Available with and without figure 8 straps for enhanced support. Offers compression, comfort, and 20% more ankle protection than a stirrup. Speed lacing feature for quicker fitting. Low profile and lightweight for any sport. Allows for normal ankle motion with all activities and sports. Constructed of highly breathable, quick drying fabric. Strongest and most supportive support manufactured today. Universal: fits both the right left sides. Available in five sizes for a perfect fit - see sizing chart tab. Product is also known as the Exoform. Mild to moderate ankle sprains and strains (grade I and II). Breathable material design with a soft plastic outer shell design. I have drop foot as the result of a gunshot wound in Vietnam. This means that my left foot just hangs loose -- no control. If I don't wear the brace, I have a really good chance of stepping wrong, and of spraining or breaking my ankle. Before using the brace, I sprained my ankle, and it expanded to the size of a softball. The Royce brace makes sure that my foot is put down straight, and protects my ankle. I've been wearing them for about 15 years, every day, They last about 6 to 8 months before I buy a replacement. They do what they are designed to do, very well. After my old braces fell apart from use, I was looking for a suitable but better replacement that was light, usable for sports, and didn't take too long to put on. I bought two of these braces without the figure eight strap and so far after a couple of uses I do get the support I need for the quick stops and pivots. So far so good. I didn't mark the braces at five star as I need to find out how they hold up after a couple of months playing two to three times a week however you can't beat the price from DME. I'm an avid hiker and have been hiking for over 15 years. As I get older I'm starting to realize that my bones and joints are not as strong as they used to be. I needed ankle support to prevent any future injury. I came across this brace and purchased two for my left and right ankles. I went ahead with the figure 8 strap model for extra support. I am glad to say that these ankle supports have worked wonders and have prolonged my hiking career. Royce Medical believes that the best way for you to select and purchase an Royce Medical product is at one of its authorized online stores of which DME-Direct is one. Only in these stores can you be sure to find the latest Royce Medical collection and ensure you are getting a genuine Royce Medical product with the manufacturer's full warranty. Royce Medical therefore recommends that you do not purchase an Royce Medical item through any website, unless it is an authorized Royce Medical dealer. We are a Royce Medical Authorized Dealer and can assure you a safe and pleasant shopping experience here at our website as if you were at our wholesale distribution premises in Valencia, California. Some non-authorized sites sell counterfeit, second-hand merchandise, and/or products containing old fabrics, glues, and resins that do not perform as intended, and are therefore, not eligible for care under the Royce Medical warranty. Others do not offer the original Royce Medical warranty, nor do they offer any after-sales service of any kind. Royce Medical takes great care to ensure that all Royce Medical authorized dealers offer you the very best products and service. Please take advantage of the peace of mind that only they can offer to Royce Medical purchasers.